Paul Ehrlich wrong again: World Cereal Production Set To Reach Historic High | Watts Up With That? Thanks to The GWPF and Dr. Benny Peiser for that roundup. It’s been three months since Anne and I summarized our views on this topic for the Royal Society, and we’ve been pleased that it has generated a fair amount of discussion and particularly, invitations to share our take on the future in various forum in the U.S., Australia, and New Zealand. So far the paper has not elicited any significant attacks, save one “rebuttal” based on climate denial that was rejected by a journal. But it has also not yet generated some of the discussion we might have hoped for, especially on key issues such as how to buffer the global agricultural system against global change so as to retain a real possibility of at least maintaining today’s nutritional situation and steps that need to be taken to increase human security against vast epidemics (such as that which now may be threatened by the H7N9 “bird flu” virus). I’d love to see him explain how the world agricultural system will collapse in the face of gains like this, it should be entertaining. When has Paul Ehrlich EVER been right? How does this serial failure maintain any credibility? I wonder about this considering the damage to China’s wheat crop (up to 16% so far being declared unfit for human use due to cold, wet conditions), the loss of a good portion of the US winter wheat crop due to severe cold, loss of crops in Europe due to cold/wet conditions, and the current loss of some crops, particularly in the mid-Atlantic region, due to continued wet conditions. A friend of mine in a mid-Atlantic state told me that most of the summer grain crop is down due to wet/windy conditions. The heads of the grain got large due to a lot of rain and wind has blown it onto the ground. We are looking at another 7 to 9 days out of the next 10 with rain in the Eastern US. I believe the quote is relevant to conversations, arguments, discussions or attempts to reason with progressives. Total food production per capita has outpaced population growth. Now, if we can only stop the diversion of cereal crops to ethanol production – that’s where the REAL deficit in them is. This paper breaks cereal production down into seven regions, and finds it is decreasing per capita in five of them: North America/Oceania, Europe/FSU, Sub-Saharan Africa, the Middle East, and Latin America. Ehrlich is like a living study in human stupidity, in that the guy has predicted disasters decade after decade that have never come to pass, and yet some people still pay attention to what he’s got to say. There’s a sucker born every minute, I guess. Based on current demographic trends, by 2050 Europe’s population will have fallen 25%; the US population will go below 300 million; China’s median age will be about 50 as its population begin to plunge downward; Japan’s population will have dropped 35%, and most of Asia and North Africa will begin losing people. This demand demand for food will decrease, as will the number of acres farmed. Demand for energy will drop rapidly, commodity prices will plunge, as strong deflationary pressures mount on a global scale. As the number of consumers and producers fall, so will the demand for food, energy, and consumer goods. It is high time the UN wake-up to this demographic nightmare. The AGW fetish has run its course. It speaks very poorly of The Royal Society that there weren’t wholesale resignations when that once-august institution decided to confer Fellowship on Paul Erlich. Kon, you took the words right out of my keyboard. Plants produce 67 pounds of sugar for every 100 pounds of CO2 they extract from the air, by weight. He says what the glitterati want to hear. Let’s see, John West goes with a university study. Sedron goes with propaganda sites full of maybe, mights, and what ifs. Who to believe? I’ll stick with the science. Ehrlich would still give the wrong answer if he stood in front of a clock and you asked him for the time of day. Only in leftie academics could he rise above an assistant janitorial position. If the current predictions from Russia of a Maunder minimum are borne out, then I expect he will be ‘right’ if only for the wrong reasons. If the ‘grow line’ for crops moves 500 miles equatorward then the world is in a LOT of trouble. This could happen quite rapidly. The 50% increase in US corn productivity since ~2000 has been burnt via forced ethanol production. leaving no increase in exports to feed the growing world population. Over the past decade, the increased use of corn for ethanol has been largely matched by the increased corn harvest attributable mainly to increased yields. . . . The U.S. production of ethanol increased by an order of magnitude over the past 15 years, reached 13 billion gallons (49 billion liters) in 2010, and grew at 15−20% per year over the last two decades. . . .In 1990, the production of ethanol required processing approximately 3% of the corn harvest, but in 2010 that figure was 37%. The U.S. Renewable Fuel Standard calls for the use of 36 billion gallons (136 billion liters) of biofuel by 2022 with a maximum of 15 billion gallons of corn ethanol (more could be produced but it would not count toward meeting the standard). Lies by omission. That chart leaves out the USA, Canada, EU and Australia. Four big cereal producers. In round numbers, U.S. farmers produce about $ 143 billion worth of crops and about $153 billion worth of livestock each year…. Corn: The United States is, by far, the largest producer of corn in the world, producing 32 percent of the world’s corn crop in the early 2010s. Corn is grown on over 400,000 U.S. farms. The U.S. exports about 20 percent of the U.S. farmer’s corn production…..
Soybeans: Approximately 3.06 billion bushels of soybeans were harvested from 73.6 million acres of cropland in the U.S. in 2011…. Soybeans rank second, after corn, …. Over 279,110 (2007 Census of Agriculture) farms in the U.S. produce soybeans making the U.S. the largest producer and exporter of soybeans. , accounting for over 50% of the world’s soybean production and $3-4 billion in soybean and product exports in the late 2000s. Soybeans represent 50 percent of world oilseed production.…. Wheat: Over 160,810 (2007 Census of Agriculture)farms in the United States produce wheat and wheat production exceeds 2.27 billion bushels a year. The U.S. produces about 10% of the world’s wheat and supplies about 25% of the world’s wheat export market…. Grain sorghum: I….Grain Sorghumis used primarily as an animal feed, but also is used in food products and as an industrial feedstock….Worldwide, over half of the sorghum grown is for human consumption. Some farmers grow sorghum as a hedge against drought. This water-efficient crop is more drought tolerant and requires fewer inputs than corn. Kansas, Texas, Nebraska, Oklahoma, and Missouri produce most of the grain sorghum grown in this country. The U.S. exports almost half of the sorghum it produces and controls 70% to 80% of world sorghum exports. Rice: ….U.S. rice production accounts for just under 2% of the world’s total, but this country is the second leading rice exporter with 10% of the world market. About 50 – 60% of the rice consumed in the U.S. is for direct food use; another 18% goes into processed foods, 10-12 percent goes into pet food, and most of the rest (about 10 percent) goes into beer production…..
Cotton: …. According to the National Cotton Council of America, farms in those states produce over 30% of the world’s cotton with annual exports of more than $7 billion…..
China is the larges producer of wheat and India is second largest. The United States is the third largest producer of wheat in the world. France is the fourth largest producer of wheat, Russia is the fifth largest producer of wheat in the world, and Canada is the sixth largest producer. Australia is the seventh largest wheat producer in the world, and exports average 14,936 TMT, which is over 75% of their total production, and makes Australia one of the largest exporters of wheat in the world. Germany is the eighth largest producer of wheat and the sixth largest wheat exporter in the world. So, a 3% area of the world is the main supplier. What does that tell a sensible, unfettered mind? The US does this and also can stupidly produce most of the world’s ethanol fuel from corn to keep Luddites happy, too (maybe expanding your thesis intelligently you could discover why the volatility – hint it’s in the front of this sentence). Yeah, perhaps you can convince yourself of terrible things about capitalism if you want to believe them, but from what you say, the alternative is massive death from starvation in apparently 97% of the rest of the world’s area if the destroyers succeed in crippling the US 3%. Instead of being a useful fool of the economy-destruction sector, you would be a Nobel Prize winner if you could get just another 3% to follow US agriculture methodology. Oh, and one way to tell an agenda-brain-washed individual is his continuing applause for a guy who has never been right. There is nothing to criticize Paul Disaster Ehrlich for? I knew a cranky guy like this who really was trying to get even with his father. Amstutz was VP of Cargill. He wrote the WTO Agreement on Ag in 1995. (Even Clinton admitted that agreement lead to starvation and riots of 2008) Amstutz then wrote the Freedom to Farm act in 1996. This law was later called the Freedom to Fail act as US farmers over produced and grain prices dropped like a rock. Grain traders used the surplus of very cheap grain to bankrupt farmers around the world. This was actually a KNOWN US policy as Clinton has just admitted. Amstutz was also responsible for wiping out the US grain reserve system. How to fight a food crisis: To blunt the ravages of drought and market greed, we need a national grain reserve… the 1996 Freedom to Farm Act abolished our national system of holding grain in reserve. Amstutz then went to work for Goldman Sachs. This has always puzzled me until I finally ran across the last piece of the puzzle. ..Painter said Judge Bruce Levine … had a secret agreement with a former Republican chairwoman of the agency to stand in the way of investors filing complaints with the agency. “On Judge Levine’s first week on the job, nearly twenty years ago, he came into my office and stated that he had promised Wendy Gramm, then Chairwoman of the Commission, that we would never rule in a complainant’s favor,” Painter wrote. “A review of his rulings will confirm that he fulfilled his vow…. Levine had never ruled in favor of an investor. Gramm [wife of former senator Phil Gramm (R-Tex. )], was head of the CFTC just before president Bill Clinton took office. She has been criticized by Democrats for helping firms such as Goldman Sachs and Enron gain influence over the commodity markets. After leaving the CFTC, she joined Enron’s board. NOW we know WHY Goldman Sachs hired Dan Amstutz! This is the story of how some of the richest people in the world – Goldman, Deutsche Bank, the traders at Merrill Lynch, and more – have caused the starvation of some of the poorest people in the world. At the end of 2006, food prices across the world started to rise, suddenly and stratospherically. Within a year, the price of wheat had shot up by 80 per cent, maize by 90 per cent, rice by 320 per cent. In a global jolt of hunger, 200 million people – mostly children – couldn’t afford to get food any more, and sank into malnutrition or starvation. There were riots in more than 30 countries, and at least one government was violently overthrown. Then, in spring 2008, prices just as mysteriously fell back to their previous level. Jean Ziegler, the UN Special Rapporteur on the Right to Food, calls it “a silent mass murder”, entirely due to “man-made actions.” Through the 1990s, Goldman Sachs and others lobbied hard and the regulations [controlling agricultural futures contracts] were abolished. Suddenly, these contracts were turned into “derivatives” that could be bought and sold among traders who had nothing to do with agriculture. A market in “food speculation” was born. The speculators drove the price through the roof. Dan Amstutz was president of the North American Export Grain Association. They even named an award after the B@$t@rd! …. there were real warnings about possible starvation as a consequence of the law Sarasohn refers to [the Energy Independence and Security Act of 2007 ]. The possible consequences were clearly communicated in a Senate briefing a week before initial passage of the Senate bill and 6 months before final approval of the final House-Senate bill. The U.S. corn crop, accounting for 40 percent of the global harvest and supplying nearly 70 percent of the world’s corn imports, looms large in the world food economy. Annual U.S. corn exports of some 55 million tons account for nearly one fourth of world grain exports. The corn harvest of Iowa alone exceeds the entire grain harvest of Canada. Substantially reducing this export flow would send shock waves throughout the world economy. WHO PROFITS? That should alway be the question you ask about any seemingly idiotic moves by politicians. I often wonder why more people have heard of Paul Ehrlich than have heard of Norman Borlaug. Ehrlich continues to be wrong with his doomsday predictions; Borlaug introduced high-yielding varieties of whet combined with modern agricultural production techniques around the world and has been credited with saving over a billion people from starvation. The world per capita demand for cereals is actually stagnant since the 1970s. This overall stagnation results from diminishing per capita demand in developed countries and still rising per capita demand in developing countries. Another process underlying the stagnant per capita demand for cereals is a slightly decreasing per capita demand for cereals as human food, and increasing per capita demand for cereals for other purposes (mainly for animal feed, and secondarily for biofuels). In the meanwhile, per capita demand for non-cereal foods is increasing, especially vegetable oil, meat of various kinds, fruit, vegetables and more. The adequate metric for total food production (or total agricultural production including non-food products such as hides, tobacco or wool) is total value of production at world average producer prices, converted into a common currency at Purchasing Power Parity conversion rates. FAO provides this metric in FAOSTAT (production – value of production). It has been increasing in per capita terms since the beginning of the series in 1961. Sedron is a paid drone, a Progressive apparatchik whose world view is centered on belief rather than reason. Ehrlich is like a living study in human stupidity, in that the guy has predicted disasters decade after decade that have never come to pass, and yet some people still pay attention to what he’s got to say….. Worse his co-author, John Holdern became Obama’s Science Czar. Forced abortions. Mass sterilization. A “Planetary Regime” with the power of life and death over American citizens…. …Below you will find photographs, scans, and transcriptions of pages in the book Ecoscience, co-authored in 1977 by John Holdren and his close colleagues Paul Ehrlich and Anne Ehrlich. The scans and photos are provided to supply conclusive evidence that the words attributed to Holdren are unaltered and accurately transcribed. This report was originally inspired by this article in FrontPage magazine, which covers some of the same information given here. But that article, although it contained many shocking quotes from John Holdren, failed to make much of an impact on public opinion. Why not? Because, as I discovered when discussing the article with various friends, there was no proof that the quotes were accurate — so most folks (even those opposed to Obama’s policies) doubted their veracity, because the statements seemed too inflammatory to be true. In the modern era, it seems, journalists have lost all credibility, and so are presumed to be lying or exaggerating unless solid evidence is offered to back up the claims. Well, this report contains that evidence…. Below you will find a series of ten short passages from Ecoscience. On the left in each case is a scanned image taken directly from the pages of the book itself; on the right is an exact transcription of each passage, with noteworthy sections highlighted. Below each quote is a short analysis by me…..
Shaw should know since he was co-founder of the Fabian society the well from which the progressives sprung. Gail, you like so many people, believe that countries like Haiti are unable to counter the actions of America in her trade dealings. What you are basically saying is that places like Haiti are governed badly as though that is America’s fault. Why are you so keen to excuse bad governance in third world countries as if it is the fault of others? Haiti has been independent of France for over 200 years. It is an economic and social catastrophe through the fault of its political leadership. America , like other advanced societies , will take advantage of this situation and why shouldn’t it. Until Haiti, and others , learn that being useless has big consequences they will never get their act together. That is nobody’s fault but their own. Instead what we find are societies that claim equality and the right to pursue their own philosophies without interference yet claim exploitation when they fail. Good governance is the solution and if they are not up to the task so be it. That is the way the world works. The paper you are quoting is from 1999 – there have been significant changes to most indicators since this time and a much more optimistic outlook now pertains to a number of the factors in this paper. 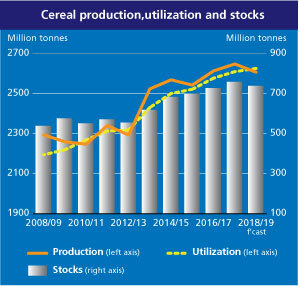 Primarily, productivity gains in the major cereals are on the rise and the FAO review quoted in the article points out that the increase in production has outpaced increases in population. Furthermore, estimates of population increase have declined over the past 15 years, with more recognition that reduced poverty and increased child mortality leads to reduced birth rates in developing countries. There is a long way to go, but progress is being made, especially in Africa which missed out significantly on the agricultural productivity gains in the 70’s and 80’s. The IEEE article (also listed above) focussed on Africa in particular and noted that much of the improvement is based on adoption of ideas and technologies which are hardly new, but which had not been seen in Africa. Yes, we all trumpet cutting edge breakthroughs, but there is a long way between the highest and lowest yields even in a continent where productivity has been comparatively low. Raising the lowest to even a median level represents a productivity increase far in excess of that required just to cope with population growth. …..If the ‘grow line’ for crops moves 500 miles equatorward then the world is in a LOT of trouble. This could happen quite rapidly. (Ahem) Of course, climate change is expected to directly affect TOTAL production, leading to lower per capita as a result. Any reduction in per capita production, as total production increases, must (kinda by definition) be because of increasing population. To date at least, by far the biggest effect of climate change on available food has been the diversion of crops from food to fuel. Thomas Homer-Dixon, Director of CIGI, last year was playing the same card with wheat and drought… Debunked again… I better understand why he sticks to anti pipeline politics these days! The decline in demand will be offset, partly or entirely, by the rising standard of living of the poorest Earthicans. Think of a world population with, on average, the living standards (and per capita demands) of the US today (the future US will be even richer, if our electorate stops mucking things up). The good news is that more efficient production and higher yields may allow some reduction in the total amount of farmland needed with a hoped for reduction in habitat destruction. Thanks, I was unaware of that about Holdren. ….Gail, you like so many people, believe that countries like Haiti are unable to counter the actions of America in her trade dealings. What you are basically saying is that places like Haiti are governed badly as though that is America’s fault…. Until people figure out the ‘Us’ vs “Them” is not about progressives vs capitalists or blacks vs whites but about those who would rule us through lies and stealth vs the people who pay through taxes and in some cases lives this world will never be a better place. IMHO our politicians are very rapidly hauling us toward a worldwide totalitarian state. Sound like a lunatics Conspiracy until you read the direct quotes from people like Pascal Lamy, Director General of the WTO. ….climate change negotiations are not just about the global environment but global economics as well — the way that technology, costs and growth are to be distributed and shared…. Can we balance the need for a sustainable planet with the need to provide billions with decent living standards? Can we do that without questioning radically the Western way of life? …. It is true that popular criticism of globalization can be irrational — or worse…. This raises a final challenge: How to provide global leadership? Mobilizing collective purpose is more difficult when we no longer face one common enemy… But the Cold War “glue” has disappeared…. All had lived through the chaos of the 1930s — when turning inwards led to economic depression, nationalism and war. All, including the defeated powers, agreed that the road to peace lay with building a new international order — and an approach to international relations that questioned the Westphalian, sacrosanct principle of sovereignty — rooted in freedom, openness, prosperity and interdependence. You can also look at the IMF. Most feel that we live in an integrated globalized world. But when looking at recent history, what can one really say about the nature of this integration? It seems there are three fundamental trends at work that today characterize the world economy…. The first trend is a new convergence…. New convergence and strengthened interdependence coincide with a third trend, relating to income distribution. In many countries the distribution of income has become more unequal, and the top earners’ share of income in particular has risen dramatically. In the United States the share of the top 1 percent has close to tripled over the past three decades, now accounting for about 20 percent of total U.S. income (Alvaredo and others, 2012). At the same time, while the new convergence mentioned above has reduced the distance between advanced and developing economies when they are taken as two aggregates, there are still millions of people in some of the poorest countries whose incomes have remained almost stagnant for more than a century…..
….The world economy remains one of interdependence, where countries’ business cycles travel across borders… The recent global growth declines in early 2012, due much more to macroeconomic and financial sector management issues than to long-term supply-side factors, vividly reflect this worldwide interdependence….. There is a reason why interdependence vs self-sufficiency is being fostered by the world’s elite (aside from raking in mega bucks) Haiti was just a casualty of that movement and it is an intentional movement. Does economic interdependence increase or decrease the probability of war among states? With the Cold War over, this question is taking on importance as trade levels between established powers such as the United States and Russia and emerging powers such as Japan, China, and Western Europe grow to new heights. In this article, I provide a new dynamic theory to help overcome some of the theoretical and empirical problems with current liberal and realist views on the question….. The unsatisfactory nature of both liberal and realist theories is shown by their difficulties in explaining the run-ups to the two World Wars. The period up to World War I exposes a glaring anomaly for liberal theory: the European powers had reached unprecedented levels of trade, yet that did not prevent them from going to war. Realists certainly have the correlation right – the war was preceded by high interdependence – but trade levels had been high for the previous thirty years; hence, even if interdependence was a necessary condition for the war, it was not sufficient…. …Just to give perspective on this incredible murder by government, if all these bodies were laid head to toe, with the average height being 5′, then they would circle the earth ten times. Also, this democide murdered 6 times more people than died in combat in all the foreign and internal wars of the century.…. Given the extent and detail of these books, the reader may be surprised that the primary purpose was not to describe democide itself, but to determine its nature and amount in order to test the theory that democracies are inherently nonviolent. They should have no wars between them, the least foreign violence and government related or directed domestic violence (revolutions, coups, guerrilla war, and the like), and relatively little domestic democide. I have substantiated the war, foreign, and domestic violence parts of this theory in previous works3and took up the research associated with this book and its three predecessors in order to test the democide component. As will be seen, the results here clearly and decisively show that democracies commit less democide than other regimes. These results also well illustrate the principle underlying all my findings on war, collective violence, and democide, which is that the less freedom people have the more violence, the more freedom the less violence. I put this here as the Power Principle: power kills, absolute power kills absolutely. My goal is to fight the accumulation of power by the unelected by shining a spot light on their activities. Yes, Trying reading up on what the Fabian founders wanted if you really want nightmares! And the USA was no better. In 1973, Elaine Riddick had been married for a year when she and her husband decided to start a family. She was surprised when her Brooklyn doctor told her it wasn’t possible—and even more surprised to discover why: She’d been medically sterilized during a hospital stay in rural Edenton, N.C…..
…Riddick is one of an estimated 7,600 North Carolinians sterilized under the state’s eugenics program. On the books from 1929-74, its goal was to keep those deemed to have undesirable traits from having kids. The vast majority marked for sterilization were minorities, poor, undereducated, institutionalized, sick, or disabled. Eighty-five percent were female, some as young as 10 years old…..
Indiana enacted the country’s first eugenics legislation in 1907. Eventually 32 states followed, and more than 60,000 people underwent forced sterilization….. If you think this is “Old News” you are wrong. Thanks, I’m not paranoid after all, they are out to get me. Sedron, you assert that grain production has become more volatile. Droughts and floods have affected grain production throughout all history (earliest recorded that I am aware of is Egypt in the time of Joseph). That is the entire reason of building reserves. Second, per capita grain production should be expected to level off at some point. Once I have the ability to consume 2,000 calories per day more wealth will not increase my consumption. Let’s consider a world in which much less third world agricultural production goes to rot (almost twice the amount in the US). Even without any improvements in yield there could be a drastic drop in production to give the same amount of edible calories. Now lets add to that world an abolition of favorable treatment of ethanol. Grain production per capita would again be expected to drop. So, remove distortive subsidies and improve third world delivery efficiencies and production should be expected to plummet even as more people are well fed. Even if Ehrlich were right about production he would still be wrong about hunger. Note – primary rot in third world countries is primarily before delivery to final consumers while in the first world it is after. We can afford to throw away food when it goes bead in our refrigerator, third world countries have to throw it away because it goes bad in a warehouse somewhere. Thus even though we are often referred to as “wasteful” when it comes to food, we waste less than poorer countries. Somebody please build more electricity generation capacity in Africa and India so they can use refrigerators to improve the food storage situation. It’s funny that they still talk about food shortages, when obesity is such a growing (no pun intended) problem. There’s way too much food, not a dearth of it. You are correct if we do get a a Dalton minimum or Maunder Minimum the planet will have less water which means more difficult to feed our people. Gail Combs seems to have some reasons why a country would eliminate one of the primary functions of what government has done for thousands of years. Store food for bad times. The US government at this point is not working for it’s people. Sedron L @ July 22, 2013 at 9:12 am talks about per capita. There must be something amiss with your chart because it does not square with reality. Worldwide, starvation is on the decrease. Per capita caloric intake is on the increase. And India — which for decades was synonymous with starvation – is now exporting food. It could be that the data sources for the chart are faulty, but there are a few peculiarities of the chart: First, it leaves off key food-production areas of the world. Second, the forward projections of decrease are not consistent with the historic record – even with the historic record presented in the chart. Third, the area of primary concern – with historic downward trends — would be Eastern Africa, and there are lots of reasons why this data may not be reliable for a projection: the area has low production so that any disruption either in production or reporting could be responsible for the trend. Potential disruption could be (a) wars in Sudan, Ethiopia, Eretria, Somalia, etc. – where not only production could be disruption but also data collection could be most dangerous; (b) Kenyan efforts to preserve wildlife parks at the expense of agriculture; (c) the destruction of productive farms in the transition from Rhodesia to Zimbabwe – an ongoing catastrophe; and (d) the socialist disaster of Mozambique. Arid areas of the Earth are greening. The Sahel and the biosphere in general. According to Ehrlich India was supposed to be the land of skelator, yet last year it was the world’s top exporter of rice. We are doomed……………again! What I don’t understand is why, with so many spectacular failed predictions, does Paul ‘Nostradamus’ Ehrlich continue? How will history remember him? Not for being right that’s for sure. Ehrlich’s views have been proven wrong. Updating does not change that fact. But the IEEE (international electrical and electronic engineering) is hardly an authority either on future food security. Their article, which I studied carefully, is nothing more than a pastiche of current anecdotes that does not even begin to deal with the longer term food issues. Worse than most CAGW nonsense. This article obviously could not get published in journals traditionally dealing with agricultural topics. Just because it’s conclusions might accord with the worldviews of many AGW sceptics does not make it right. It is actually very wrong. Detailed specifics can be found in the food, water, (and climate impacts on both) chapters of Gaia’s Limits. Bottom line, irrigation has reached limits, best practice limits (feetilizer, planting types and practices) are being reached for some (not yet all, e.g. Rice) crops, intensification limits have been reached for most important crops (wheat, rice, alfalfa, potatoes, sorghum, taro…). Corn, soybeans, and vegetables are the notable intensification exceptions to date. And, some recent crop intensification practices are threatened by reversals from Darwinian pest evolution (best and most worrisome example being Ug99 wheat rust). Even the optimistic FAO explicitly does not see any present way forward to feed its projected 2050 population, save some hoped for not yet in evidence miracle. A more detailed analysis shows feeding projected 2050 popularion is just possible under a specific set of limiting assumtions (lower average daily calories than at present, no growth in certain meat proportions, unlimited ‘virtual water’) but represents a fairly certain ‘soft’ limit on global population at boutmthatntime and population. IMO Best this site stick to its expertise, climate, rather than air ill informed biases on fundamentally different topics. Has anyone ever met a happy activist environmentalist? How about an optimistic one? You see their entire worldview is that we are ‘cereally’ doomed (pun intended) and it’s all our fault. They are the most miserable bunch of sods you could ever hope to meet. Really sad. America , like other advanced societies , will take advantage of this situation and why shouldn’t it. Until Haiti, and others , learn that being useless has big consequences they will never get their act together. That is nobody’s fault but their own. A large wealthy country can afford to flood a small poor country will cut rate goods, driving local producers out of business. At which point the large country can increase prices and take advantage of its manufactured monopoly to reap enormous profits. Such a situation is not free trade, it is market manipulation, and it kills people. Either through poverty or through force of arms to try and resist. A rich country does not need to profit in this fashion. As you sow, so shall yea reap. ….What I don’t understand is why, with so many spectacular failed predictions, does Paul ‘Nostradamus’ Ehrlich continue? How will history remember him? Not for being right that’s for sure. How history will remember Ehrlich depends entirely on who wins the current undeclared war between the tax payers and the parasites. Remember it is the winner who writes history. Paul Ehrlich, the definitive alarmist … but only in our lifetimes because he is merely a modern day clone of the alarmists of centuries ago blaming all ills of the moment like earthquakes, floods, droughts, plagues, crop failure, fire and ice on a comet in the sky or God’s wrath and sacrificed a hundred oxen and friars. The word “Science” should never appear in the same sentence as “Paul Ehrlich”, except for purposes of drawing a stark contrast, like this one. They are antonyms, polar opposites. Paul Ehrlich is no different than the kooks we used to see around Times Square and Bryant Park wearing sandwich boards that proclaimed: “The End Is Near. Repent!“. He is also a symbol of the state of decay of higher education in the USA, naturally granted tenure to ensure his continual ridiculous prophecizing with no possible accountability. …. Bottom line, irrigation has reached limits, best practice limits (feetilizer, planting types and practices) are being reached for some (not yet all, e.g. Rice) crops, intensification limits have been reached for most important crops (wheat, rice, alfalfa, potatoes, sorghum, taro…). Corn, soybeans, and vegetables are the notable intensification exceptions to date. And, some recent crop intensification practices are threatened by reversals from Darwinian pest evolution (best and most worrisome example being Ug99 wheat rust)…. To some extent you are correct however you are leaving out the most basic principle. If left alone to get on with it mankind is highly innovative and quite capable of coming up with methods for growing food yet undreamed. When ever someone says something like this I think of the old woman I met in the 1970’s. During her lifetime she saw the USA go from horse drawn wagons and outhouses to space travel and computers. It is only the greedy and the envious and the Luddites they are manipulating that hold mankind back from a decent standard of living. Worse it is done intentionally. To me it is even worse because it was done under the guise of ‘Socialism’ by President Clinton and his Fabian/Socialist buddies Tony Blair, UN Special Envoy and WTO Director Pascal Lamy (The WTO on Agriculture: Food as a Commodity) among others. Following your own logic, you should therefore not be offering others advice. Rather you should stick to climate. As to the expertise of readers on this site, I expect more than a few are like myself. I found that Climate Doctrine was at odds with the findings in my own areas of expertise. I tried to make this information public on sites like Real Climate and was shouted down, censored, and not allowed even the basic fundamentals of reasoned argument and debate. And I asked myself why? Why if the science is settled, if the researchers are so certain of their results, why would they act in this fashion to prevent reasoned debate. That is not how science works. So I researched the question and found the answer. Climate Science is not a science. No true science needs to include the word “science” in its name. Climate Science is a cult, a belief system, a religion dressed in the trappings of science. It is a high priest, wearing a lab coat, carrying a clip board. Any time something happens to fit the belief, that is proof of the belief. Every time something happens to contradict the belief, that is evidence that change is just around the corner, and with this change will come even more proof of the belief. when obesity is such a growing (no pun intended) problem. shortage of micro nutrients from food produced on heavily farmed land will induce food cravings in the population, increasing the rate of obesity. perhaps the solution to obesity is a simple as adding some dirt from the ocean bottom to our diet. Perhaps an easier solution would be to close all McDonalds, Wendys, Burger Kings et al. Fat may be ugly, but, like ugly cars and ugly houses and ugly music, FAT IS FREEDOM. LOL, even if all the fast-food places were closed, they’d still go buy a box of doughnuts and eat the whole thing topped off with two bottles of sugary pop. Most American farmland’s nutrient content is, I believe, well-maintained by planting nitrogen (or other nutrient)-replacing cover crops in the off-season, crop rotation, and or fertilizing. It is the “organic” and “sustainable” divisions of the Fantasy Science Club who falsely mischaracterize mainline farming as less healthy (along with their cohorts in the “no gene splicing/Franken food” flummadiddle chapter). Most farmers with farms of any size in this valley have bachelors degrees (or at least one of their kids do) in Agriculture from W.S.U. (Wash State) or O.S.U. (Oregon State) (or have the Envirostalinists taken over O.S.U., Jim S.?). They learn the hard science of farming. “Helping farmers? How?” I asked. “By telling them how to farm with less water and less damage to the environment and, well, sustainable farming methods,” she replied fervently. Silence. Change of subject. Guess she decided she’d better go attend one of the meetings of the brethren before she tried again to make a convert. And they do try. Have you noticed this? ANY chance they get, the few libs I have a chat with now and then try to convert me to the AGW cult. I encountered one in the plant section of Fred Meyer last May. “…. and have you noticed how HOT it’s been? I can hardly keep my plants watered.” We had had about 3 days of temperatures in the upper 70’s/lower 80’s F. — after which, it started raining again. Have you even paid attention to recent population trends on a global level? By 2050, no one will be talking about a “population bomb”, anymore. Heck, Japan and Russia are already losing population. Europe’s population will be down a quarter from where it is now. The US will more than likely fall below 300 million by 2050 (that is unless it can find tens of millions of fertile immigrants). Even Mexico and South America have birth rates at or below replacement levels. China is a demographic time bomb, and India’s population growth rate has peaked. The problem of population and food by 2050 will not due to over farming or over population. Most American farmland’s nutrient content is, I believe, well-maintained by planting nitrogen (or other nutrient)-replacing cover crops in the off-season, crop rotation, and or fertilizing…..
Actually not. Cover crops cost money (White Dutch Clover and Korean Lespedeza is ~ $200/50lbs) and time and effort so it is often not done especially on rented or commercial farmland. My farm lost over two foot of top soil and is now down to pure clay (98% per soil analysis), that is why it was sold. Fertilizers do not put back the micro-nutrients. or organic matter. I notice that fire ant mounds on my farm were surrounded by much greener, lusher grass which may indicate nutrients deep in the soil had been brought to the surface by the ants. I also found switching from a livestock salt block (mainly NaCl) to loose mineral salts had a significant effect on my livestock. Less grain was needed to keep condition, coat color became more intense and did not fade as much in the sun and less worming was needed across three different species, horse, sheep and goat. All three species have coat colors of white, black and various shades of brown. Soil samples from the Alberta Environmentally Sustainable Agriculture (AESA) Soil Quality Resource Monitoring Program Benchmark Sites were analyzed for 30 micronutrients and trace elements. The broad scan of micronutrient and trace elements provides useful baseline information regarding the variability and range of element concentrations within ecoregions, soil types and landscapes. This report describes the influence of ecoregions, soil properties and historic management practices on boron (B), chloride (Cl), cobalt (Co), molybdenum (Mo), nickel (Ni), silicon (Si), chromium (Cr), cadmium (Cd) and selenium (Se). Significant differences between ecoregions were found in the o-15 cm soil samples for the elements B, Cd, and Mo, as well as for Cd in the 15-30 cm depth. Slope position had a significant effect on B, Ni, Co, Si, Cd and Se; and in most instances the highest values occurred in the lower slope position. Significant (p>0.05) differences between other elements and selected soil properties were found for B, Mo, Ni, Co, Cd and Se. Management did not appear to have an impact on the micronutrients and trace elements, although management practices that influence soil organic matter could influence some elements. No evidence of toxic levels of B, Mo, Cr or Cd was noted at any of the benchmark locations, although Ni may have the potential of causing phytotoxicity at one site. Many of the sites may deficient in Cl for crop production and low Se may be an issue for livestock production at some of the locations. Further investigation, including plant tissue analysis is recommended at some sites for the elements Ni, Si, Cr, Cd and Se. The literature does not provide well-defined criteria for determining deficiency or toxicity for many trace elements. While there was limited information for some of the elements, the extraction methods utilized were different from methods used in this study, making comparisons difficult. Sampling the upper, mid and lower slope positions at each of the sites provided valuable information on the distribution of the elements within the landscape. Micronutrient and trace element analysis of some crop samples would provide useful supplemental information for interpreting the soil data. In other words no one has really bothered to really look at micronutrients except in livestock. Micronutrients, also known as trace minerals, which chiefly include boron (B), molybdenum (Mo), copper (Cu), zinc (Zn), manganese (Mn) and iron (Fe), are required in extremely small quantities by crops and livestock. Their name, however, is not meant to imply their role is minor. Their lack, e.g., can cause serious crop production problems in forages and health disorders in livestock. This presentation includes the response of forage legumes and grasses to micronutrients, their deficiency and sufficiency levels in forages and their sufficiency levels in livestock. Forage legumes are more responsive to micronutrients, particularly B and Mo, than grasses. There are fewer documented cases of Cu, Fe, Mn and Zn deficiencies than of B and Mo deficiencies in forages. Soil acidity is one of the primary factors affecting the availability of micronutrients to forages. Low soil pH, e.g., is the principal cause of Mo deficiency in soybeans in Brazil and in a variety of crops in eastern Canada. More often soil properties and environmental factors are more important than actual soil levels, in affecting micronutrient availability. Micronutrient deficiencies have been emerging as a major problem in intensively cultivated soils in many countries and have become one of the serious constraints to crop productivity. Deficiency symptoms for most micronutrients appear on the young leaves at the top of the plant, because most of these nutrients are not readily translocated. However, Mo is an exception in that it is readily translocated, and its deficiency symptoms generally appear on the whole plant. Toxicity symptoms, on the other hand, for most micronutrients appear on the older leaves of the plant which is very striking, e.g., for B. Soil, foliar and seed applied methods of micronutrient application to control their deficiency are discussed in detail. Frequently the Cu, Fe, Mn, Zn and Se levels in forages which are sufficient for optimum crop yields are notadequate to meet the needs of livestock. Selenium is a trace mineral which is not required byplants and maximum forage yields can be obtained on soils with very low amounts of soil Se.However, if animals are fed forage with low Se, they could suffer from serious muscular disorders and other diseases. White muscle disease caused due to Se deficiency is the most common disorder and is found in calves and lambs. Sufficiency levels of micronutrients for crops have been discussed in relation to the animal requirement. We used ion-exchange resin bags to investigate effects of water additions, chemical amendments, and plant presence on in situ measures of nutrient bioavailability in conjunction with a study examining soil controls of ecosystem invasion by the exotic annual grass Bromus tectorum L. At five dryland sites in southeastern Utah, USA, resin bags were buried in experimental plots randomly assigned to combinations of two watering treatments (wet and dry), four chemical-amendment treatments (KCl, MgO, CaO, and no amendment), and four plant treatments (B. tectorum alone, the perennial bunchgrass Stipa hymenoides R. & S. alone, B. tectorum and S. hymenoides together, and no plants)…. When averaged across watering treatments, plots receiving KCl applications had lower resin-bag NO 3 − than plots receiving no chemical amendments during three of four measurement periods—probably due to NO 3 − displacement from resin bags by Cl− ions. During the January–April period, KCl application in wet plots (but not dry plots) decreased resin-bag NH 4 + and increased resin-bag NO 3 −. This interaction effect likely resulted from displacement of NH 4 + from resins by K+ ions, followed by nitrification and enhanced NO 3 − capture by resin bags. In plots not receiving KCl applications, resin-bag NH 4 + was higher in wet plots than in dry plots during the same period. During the January–April period, resin-bag measures for carbonate-related ions HPO 4 2−, Ca2+, and Mn2+ tended to be greater in the presence of B. tectorum than in the absence of B. tectorum. This trend was evident only in wet plots where B. tectorum densities were much higher than in dry plots. We attribute this pattern to the mobilization of carbonate-associated ions by root exudates of B. tectorum. These findings indicate the importance of considering potential indirect effects of soil amendments performed in conjunction with resource-limitation studies, and they suggest the need for further research concerning nutrient acquisition mechanisms of B. tectorum. Biological soil crusts (BSCs) could improve severe environment ecological conditions by increasing soil moisture, soil nitrogen concentration, and so on. In order to control desertification and recover the destroyed soil fertility utilizing a new means using BSCs, the soil surface was artificially inoculated with Microcoleus vaginatus and Scytonema javanicum. Relationships between the development of the artificially induced biological soil crusts and the distribution and dynamic changes of nitrogen and phosphorus in the soil crusts have been analyzed. Crusts of different ages were investigated by measuring soil physical and chemical factors, such as moisture, pH, total and available N content, and total and available P, which were correlated with the depths of the crusts. This study found that the types of color, shape, and species components of the algal crusts increased with crust development. Soil moisture, total N, available N, and available P increased gradually with crust growth. Soil with crusts was wetter than the controlled naked sandy soil, and a significant correlation was observed between biomass and total nitrogen (r = 0.946, P = 0.015). Soil pH was lower than that of control. The scytonemin on the soil surface was exceptionally higher than the other pigments, and all the pigments were mainly distributed at the soil surface level. Though the crusts were mainly distributed on soil surface, the available P was mainly stored below the crust layer. <b.Pearson correlation tests indicated that artificially inoculated biological crusts could improve soil fertility and micro-environment of the top soil: The development of artificially induced BSCs was very well, and this was favorable to inducing the following crust succession. It looks like the per capita production is pretty stable. And it is clear that it is being done on less land, with fewer seeds and less fertilizer. But I did like the scary projected drop in your cited graph. Too bad it doesn’t seem to have any relationship to their own data or reality. And their graph clearly shows increased yield per hectare with fewer hectares harvested. So if there really is a problem, just put some of those hectares that are no longer in production back into production. Combined with increased yield per hectare, problem solved. Consider dairy in India. Let’s postulate that each Indian averages 8 oz of milk per day, or 62 million gallons of milk for the country. Someone has to grow the crops that feed the cows that produce the milk. Now lets add refrigeration to the country so that milk can be kept for weeks instead of hours between milking and drinking. Are more or fewer gallons poured out for going sour? Do we need more or less grain? First world countries (with developed infrastructure and cheap reliable energy) are able to consume more calories even when fewer calories are produced. Any decline in produced grain absolutely must take this into account. In which countries do you think it is most likely for a large pile of corn to rot and be tossed? Probably not the one where there is controlled drying and humidity sensors in the storage silo. As these practices are adopted in other countries then we should expect grain production to fall (although an increase in protein consumption could hold the average stable). There must be something amiss with your chart because it does not square with reality. Worldwide, starvation is on the decrease. Starvation is usully a result of misallocation of resources, not the lack of them. But I did like the scary projected drop in your cited graph. I think you misread the graph — it displays no projections. @Sedron – Actually yes it does. It is the tailing off towards the right. Look again. Ha. Lack of land is part of the problem, due to sprawl, population growth, water supply and climate change. There is little land going fallow, just waiting to be put back into production. How pathetic if your scientific legacy is a litany of predictions of doom – that didn’t happen. Paul and Anne Ehrlich have been failing at predicting for at least 45 yrs now.Still these people are payed to do “research” and to present their ideas. What could better show that the peer review system doesn’t work in the short term? A good friend of mine maintains that it is ‘normal’ for bad science to take 40yrs to be corrected. Let’s see how long Paul and Anne Ehrlich get away with it. “The battle to feed all of humanity is over. In the 1970s hundreds of millions of people will starve to death in spite of any crash programs embarked upon now. At this late date nothing can prevent a substantial increase in the world death rate ….” Paul Ehrlich, “The Population Bomb, 1968. How does an awful purveyor of awfulness, one who has gotten it wrong so many times is still listened to and given any credence? Of course there is always this! I know you need to go back to your original comment. The graph YOUR link goes directly too clearly shows projections past 2021. Nice try and thanks for playing. Really? You mean the half billion extra acres of trees in North America since the 18th century are just everyone’s imagination? You mean that forest that was a farm just down the road from me, never produced? Or do you mean it destroys your meme, and you have no facts to back up such a ridiculous assertion? JP may hallucinate a dropping US/world population, but the projections are for the US to go well over 400 million by 2050. I and my children soooo look forward to California doubling again and again as it has done in my lifetime, from under 10 million to 38 million. The projections do not measure to current population trends. The last 2 years have seen the lowest birthrates in US history. The 2010 Census had the slowest rate of population growth in the US since 1932. The US’s population is growing; but it’s only growing due to long life spans. According to Census Data in 2000 and 2010, only Hispanic immigration allowed our populations to rise. And the Hispanic TFR (Total Fertility Rate) in the US dropped from 3.36 in 2005 to under 2.2 in 2011. The TFR of Mexico has dropped from 6.0 in 1970 to 2.38 in 2012. The Median Age in the US is currently 37.5 years as compared to 24 in 1972. In other words, not only is the US significantly older, but even its immigrant population is failing to reproduce at replacement levels. The US population will only continue to grow because people are dieing off slower than newborns are entering the world. Once the Baby Boomers leave this world. the US population will drop significantly unless it is replenished with foreigners. That is not likely to happen. As I stated earlier, Russia, Japan, almost all of Europe, and China are even in a worse position. Russia and Japan are already losing population. Germany is about to, as is Italy, Greece, Spain, Ireland and much of Eastern Europe. North Africa’s birthrate as now mostly below replacement levels of 2.1 births (down from an average of 5.5 births/female 40 years ago). Even India is headed for demographic problems. Most of South America has birth rates below replacement levels. Only portions of Africa and East Asia have positive birth rates. Not sure where all this growth is going to happen. The UN’s own demographic data does not support its positive projections. If current trends continue. The world’s population will peak sometime between 2035-2040 before rapidly declining after 2045-2050.